I first came across Arnold Rosner’s music on a 1990 Harmonia Mundi Modern Masters CD of tonal American 20th Century music, reviewed here and here (in a later reissue), and now available only as a download or second-hand. The work recorded there, the Responses, Hosanna and Fugue, was so evidently influenced by Vaughan Williams’s Tallis Fantasia that I was intrigued, to say the least. This disc begins with the Nocturne Op.68, in which Rosner sought to suggest the movement of planetary bodies in the vastness of space. He tried to do this by initially evoking a mysterious swirling atmosphere that is occasionally interrupted by violent outbursts. Melodic fragments gradually coalesce into a melody for strings, which is further developed and intensified by the inclusion of the rest of the orchestra. Like many such ‘descriptive’ pieces composed over the last 150 years, one would never guess at the underlying creative stimulus, but that doesn’t make it any less enjoyable. It is followed by Tempus Perfectum: A Concert Overture. Its archaic title reflects Rosner’s modern adaptation of a medieval form in 98 metre. Rosner was interested in early music and here he uses a type of canzona notable for its markedly rhythmic material and separation into distinct sections. The effect is of triads superimposed on the main theme at various points, and the work, which sounds markedly antique, gradually achieves a much more modern climax on (predominantly) strings and trumpets, before dying away. 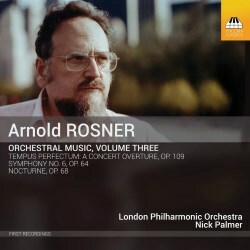 The most impressive work on this superlatively recorded and performed CD, is Rosner’s 6th Symphony. Its first movement is one of extreme emotional turbulence, represented by ferociously explosive rather angular music that lasts for its ten-minute duration. I am strongly reminded of the first movement of the Vaughan Williams Fourth Symphony, although Rosner is not quite so dour. I don’t think there can be much doubt that throughout the Symphony this influence persists, and the Sinfonia Antartica informs the second, slow movement. In fact, I am indelibly reminded of the ‘Landscape’ movement of the RVW work. Having said that, Rosner doesn’t quite manage to conjure up the stupefying power so evident in the Antartica, despite a slightly more colourful orchestral palette and a willingness to use the tam-tam almost to abandon. RVW brings an organ to the shattering climax of his symphony, but an organ is one instrument not employed by Rosner. The movement begins in a hushed atmosphere, with a slightly oriental sounding theme. This is developed towards the emotional centre of the movement where the composer’s use of strings (to emphasize the melody) is gradually superseded by the appearance of woodwind, brass and percussion to great effect. His gift of writing impactive and indeed, memorable music, is very noticeable throughout the work, but particularly so in this movement and in the last, where RVW in ‘galumphing’ mode makes an appearance early on. A reliance on the cymbals and later, the tam-tam disturbs me a little – this is a trait that is very evident in the works of some contemporary American tonal composers, perhaps influenced, however subconsciously, by film music. Notwithstanding, since I love the sound of cymbals and tam-tam in a sumptuous orchestral panoply, I will remain only very slightly disturbed and revel in the sheer orchestral splendour of the whole thing. The final five minutes or so of the last movement begin with an ethereal woodwind solo, which appears repeatedly, sometimes on the brass, only to be interrupted by cataclysmic eruptions. The movement fades into silence with quiet recollections of earlier themes. Throughout this CD the recording is truly splendiferous and the playing of the LPO is virtuosic beyond praise. It must be wonderful to hear these pieces performed live by this top-notch orchestra under the baton of a committed conductor, such as we have here in Nick Palmer. The booklet is detailed and informative in both biographical and musical detail. Toccata Classics are to be congratulated and praised for this release, consisting as it does entirely of first recordings. I look forward to others in the series.